For anyone with an interest in the future of jazz they should check out JB’s Cats’ annual concert on Sage Gateshead’s concourse stage. Noon Sunday, right on time, James Birkett’s Cats took Seven Steps to Heaven. 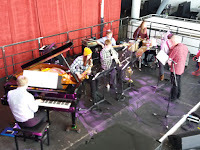 The 2017-18 edition of the band comprises seven musicians; several of them are familiar faces playing in prestigious youth ensembles including Jambone and the workshop/gigging Early Bird Band, some pitch in without fear at top-flight jam sessions and some have recorded CDs – such is the busy life of the region’s up and coming jazz musicians! The first number featured the ever-impressive Nathan Lawson on guitar, the second number of the day…WOW! Stolen Moments, absolutely brilliant, at its heart a fully-formed, mature flugelhorn solo from the diminutive Lucien Guest. This young man is something else. At the age of fifteen, perhaps sixteen, if he is thinking of going to university to study some pointless subject such as medicine or, er, physics, then the local jazz mafia needs to have a quiet word in his shell-like. Lucien has ‘JAZZ MUSICIAN’ written all over him! Joe Zawinul’s arrangement of Little Rootie Tootie showcased a speed-of-light solo from the band’s other guitarist, Thomas Henry, Ben Lawrence’s apposite Monkish stylings and the superb voicings of the horns –Alex Thompson and Lucien Guest. Neal Hefti’s After Super teased out the subtleties, fine playing from such young musicians, and their all-too-short set concluded with a rip-roaring take on A Night in Tunisia featuring Alex Thompson’s crazy, rollercoaster Moog solo and Chick Corea’s Got a Match? Special mention for the rhythm section; bassist Alex Shipsey did the business as he always does, and the real find on this session was drummer Gemma Watson. What a great player! Gemma later confirmed that her drum teacher is Roger Hempsall…that explains a lot. This was one of the sets of this year’s Gateshead International Jazz Festival.